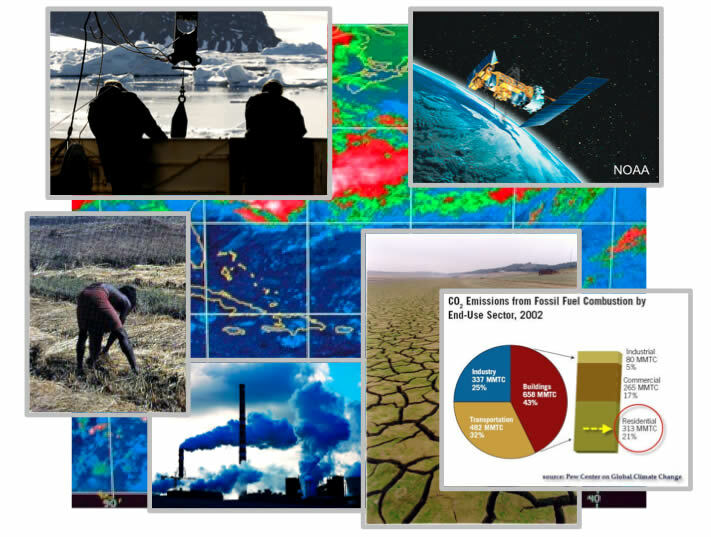 Earth systems are coupled, and therefore discovering and sharing geospatial data and processing resources across disciplines is critical for those working in geosciences and the environment. Unfortunately, professionals seeking to understand and sustainably manage water, waste, energy, pollution, forests, croplands, oceans and climate find that data and processing "stovepipes" of various kinds often make such discovery and access difficult, even within a discipline. In the OGC, universities, research organizations, NGOs, companies and government organizations work together in OGC Standards Working Groups and Domain Working Groups (such as Earth Systems Science, Hydrology, Metadata, Meteorology & Oceanography, Sensor Web Enablement) to remove technical obstacles to institutional information sharing. Often the work takes place in fast-paced interoperability experiments, testbeds and pilot projects. The benefits of this collaborative effort extend beyond data sharing to the enablement of previously unachievable data-intensive science and chained models of coupled Earth phenomena. As the US Environmental Protection Agency (EPA) says in its introduction to the Group on Earth Observations (GEO) Global Earth Observation System of Systems (GEOSS), "...while there are thousands of moored and free floating data buoys in the world's oceans, thousands of land-based environmental stations, and over 50 environmental satellites orbiting the globe, all providing millions of data sets, most of these technologies do not yet talk to each other." Even though many of these data sets are coordinated globally through existing global institutions, the constraints of efficiency, cost, timeliness and safety criticality have militated against wider exchanges that are now becoming expected. In the OGC, environmental and natural resource researchers and managers work together with geospatial technology providers to develop standards and best practices that enable diverse systems to "talk to each other." Through OGC membership, government organizations, research organizations and software vendors engage in efficient fact-finding, planning and partnering. They then develop standards that expand both the capabilities of technology users and the business opportunities for technology providers. As the market for interoperable geoprocessing technologies expands, technology providers are able to offer increasingly more effective, varied and affordable tools for users. As standards-based products and best practices become widely used, opportunities are created for researchers to access and share more scientific data. Indeed, the growing ability of networked resources to communicate with each other has created the necessary conditions for a dramatic increase in the productivity and capability of researchers and educators working in Earth system science, and these benefits will extend to environmental managers. More than 25 OGC Technical Committee Domain Working Groups (DWGs) have formed to address interoperability in particular technology and application domains. The DWGs that are most directly related to geosciences and the environment include: Catalog, Data Preservation, Data Quality, Earth Systems Science, Emergency & Disaster Management, Hydrology, Metadata, Meteorology & Oceanography, Sensor Web Enablement and University. The OGC Hydrology DWG exemplifies the ways in which geoscience and environment communities can take advantage of the OGC’s comprehensive international standards development and maintenance capabilities, technical expertise and community networking and outreach. The members of the Hydrology DWG, a joint working group of the World Meteorological Organisation (WMO) and the OGC, have created the OGC WaterML 2.0 standard. This effort has been led by an Australian government organization, the Commonwealth Scientific and Industrial Research Organisation (CSIRO), working in close collaboration with the US Consortium for the Advancement of Hydrological Sciences Inc. (CUAHSI) and other organizations. The ultimate goal is to improve the overall availability of water data and the interoperability of water information systems for hydrologic research and water resource management. Other application communities, building on their earlier data coordination efforts, have also developed community-specific OGC Geography Markup Language (GML) application schemas (AIXM for aviation, GeoSciML for geosciences, etc. ), and often this work is done in OGC working groups and OGC testbeds and interoperability experiments. OGC testbeds, pilot projects and interoperability experiments are part of the OGC Innovation Program, a global, hands-on collaborative prototyping program designed to rapidly develop, test and deliver proven candidate specifications into OGC Standards Program, where they are formalized for public release. The WaterML 2.0 specification, for example, was refined through OGC Ground Water and Surface Water Interoperability Experiments with volunteer participation from several key water agencies, companies and research groups from around the world. This work culminated in the creation of the WaterML 2.0 Standards Working Group (SWG), which is working on a few remaining details to advance the candidate WaterML 2.0 standard to become an international adopted OGC standard. GEOSS, mentioned above, is an international program to achieve comprehensive, coordinated and sustained observations of the Earth system, in order to improve monitoring of the state of the Earth, increase understanding of Earth processes, and enhance prediction of the behavior of the Earth system. The OGC is involved in GEOSS in several ways. The OGC plays the lead role for the multi-year GEOSS Architecture Implementation Pilot (AIP) and helps to organize the multi-year series of workshops that test and demonstrate interoperability in the various GEOSS societal benefit areas. Most scientific and professional disciplines that use Earth Observation (EO) systems, geographic information systems (GIS) and other geospatial technologies have special requirements that determine their data models and usual processing methods. Individual scientists, focused on their research problems, often develop even more specialized data models and methods. The industry legacy of non-interoperable proprietary geoprocessing systems has contributed to the lack of data sharing, but now vendor implementations of open interface and encoding standards have largely removed this obstacle. Scientific research, particularly interdisciplinary research involving human impacts on the natural environment, depends on access to lots of data, data that is often expensive to develop or acquire. Data sharing is the obvious solution, but researchers often have difficulty discovering what data are available and overcoming technical and institutional obstacles to accessing and using the data. Not only research, but also environmental policy and public outreach could benefit greatly from improved data sharing. The technical interoperability framework that is being developed for GEOSS is based on a set of open standards and best practices that are available to the international geoscience community. These are rapidly gaining importance in domains such as ocean observation, meteorology and hydrology. As the technical barriers to data sharing fall away, so will the institutional obstacles, as is evident in initiatives such as the US National Science Foundation's Earth Cube effort. Much of the university research that takes place in the OGC community involves advancing the capabilities of processing resources used by scientists and environmental practitioners. Standards are essential for the advancement of sensor webs, chained environmental models, semantic processing and management of data rights, provenance and quality, among other topics. See the description of activity in the University and Research domain [LINK] for more information about this research. Environmental and natural resource researchers and managers work together with geospatial technology providers in the Open Geospatial Consortium (OGC) to develop standards that enable diverse systems to talk to each other. Through OGC membership, agencies, universities, research organizations and companies have the opportunity to both participate in this progress and to engage in efficient fact-finding, planning and partnering. The standards expand both the capabilities of technology users and the business opportunities for technology providers. As the market for interoperable geoprocessing technologies expands, technology providers are able to offer increasingly more effective, varied and affordable tools for users. As standards-based products become widely used, researchers can more easily use data and models developed in neighboring domains. Advance Geospatial Digital Rights Management standards to support a range of policies and business models. The work in the OGC recognizes the growing importance of Service Oriented Architectures. Current Internet technologies have been adapted in the OGC’s consensus process to provide OGC interface and encoding standards that enable technology providers and users to overcome the non-interoperability of geospatial systems. The standards make it much easier to publish, discover, and access not only geospatial data but also geospatial data schemas and online geoprocessing services. OGC standards specify service interfaces and encodings matched to those service interfaces. Developers of proprietary and open source software implement these in their products and solutions to make their products and services part of a larger open network of such resources. OGC standards include, for example: OGC Catalogue Services - Web, Coordinate Transformation, XML-based Geography Markup Language (GML), GML in JPEG 2000, Grid Coverage Services (for gridded data), Web Feature Services (for vector data), and the Web Map Service Standard (for access to simple raster maps produced by raster or vector systems). Other standards and activities in the OGC address location services, geospatial digital rights management (GeoRM), Sensor Web Enablement (SWE), decision support service chaining, geospatial semantics, security and more. Almost all OGC standards are based on accepted Web-based distributed computing models. The standards represent 16 years of consensus work, which means that they comprise many man years of software development and contain an extraordinary amount of expertise and know-how that are available for use by anyone who cares to build on this free and unencumbered intellectual property. Participate in the OGC consensus process! OGC membership provides a cost-effective way for geoscience communities and environmental management organizations to contribute to the development of 21st century scientific data collection, processing and dissemination practices. Membership also provides unique opportunities for networking among academic, NGO, government and private sector organizations. We look forward to discussing with you how you might use the OGC to advance interoperability in your professional community. Contribute your ideas to the US National Science Foundation (NSF) for "Earth Cube"
NSF seeks transformative concepts and approaches to create integrated data management infrastructures across the Geosciences. The goal is to create a prototype Earth Cube system for an agile and robust geosciences-integrating architecture with an inclusive governance paradigm. OGC members are developing a set of white papers relevant to Earth Cube. You are invited to participate!